I grew up in New York and have spent my entire life here. 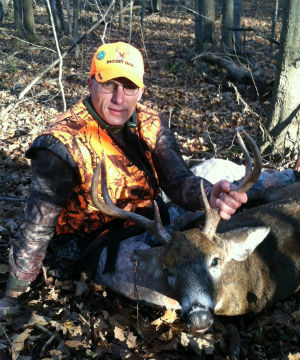 I’ve been hunting whitetails for thirty-three years and New York regular season opening days have never been kind to me. 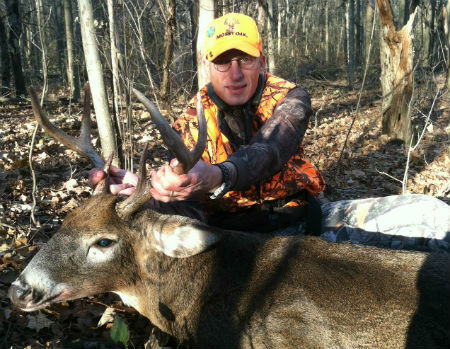 I’ve taken a few nice bucks with a bow or muzzleloader, but good bucks have eluded me on the opener. I’ve seen smaller basket racked bucks but have passed simply because I believe you can’t shoot bigger bucks if you take them when they’re smaller. I have also blown some opportunities by getting busted moving at the wrong time when a decent buck was moving in, or simply missing the shot. The 2013 New York opener dawned a beautiful, clear day, but with temperatures forecasted to reach sixty degrees, I knew the morning would be better than the afternoon. I headed to one of my tree stands where I had seen a wide eight point just three days prior, but was unable to get a shot with my bow. I walked the short distance to my stand with my friend Joe. We discussed the plan for the morning and wished each other luck. As I was walking the final 75 yards, I jumped a deer that bounded off. I couldn’t tell what it was, just saw the “flag” as it went off through the woods. I was in my stand and ready a few minutes before legal shooting light. I heard a “crack” and saw movement to my left on a low ridge. I could see antlers, but couldn’t tell whether or not it was a mature buck. The deer continued to work to my left and I watched as he approached a doe I had not seen and proceeded to mount her. I have seen pre-rut chasing behavior and plenty of video and pictures of breeding whitetails, but never personally witnessed it. After the buck finished his business, he milled around, but this was in some thick brush and I didn’t have a shot. At this point I could see that he was a mature deer with a nice spread, good mass and decent tine length. I couldn’t tell exactly how many points he had, but I had seen enough to worry about counting them later. The doe moved a few yards away and stood there with her tail in the air waiting to be bred again. It was amazing to see this firsthand not once, but a second time. As I was looking for a window of opportunity, I heard and saw another buck approaching the amorous pair. I waited to see if this second buck could be better than the first. He was comparable in body size, but slightly smaller. He appeared to be missing some points on his left side and I quickly realized that he was not as good as the first buck. He approached within about 15 yards of the larger buck, who promptly lowered his head and ran straight at him. The interloper withdrew about 40 yards and stared back in the direction of the doe that was still standing by. The larger buck made his way back toward the doe and finally gave me a good quartering away angle. I aimed for the offside shoulder and the .30-06 soft point hand load did its job. The buck went 10 yards and piled up. I was certain the buck was finished, but I waited a few minutes to get down from my stand. The doe only ran a short distance at the shot, and as she walked off, the other buck quickly took up her trail. As I was approaching my downed deer, a crotch horn and spike buck walked in my direction, apparently also drawn by the scent of the hot doe. When I reached the deer, I noticed that he was a handsome six point with three on each side. He had about an 18 inch inside spread and good mass. When my buddy, Joe, returned later to help out he mentioned that Large antlered 3x3 six point bucks are genetically rare and this particular one was a fine example. I mentioned to my wife the night before that I hadn’t ever shot a buck on opening day. I realized after I shot this buck on November 16, 2013, that the long drought was finally over for me. If I’m lucky maybe the floodgates will open.